Description: A classic ex. BN sits in the La Crosse yard enjoying the beautiful Sunday. Description: The west/north local power sits at rest. Classic pair we have here! Description: The west/north local speeds through Brice Prairie with a RCO unit filling in for a bad ordered SD40-2. Description: The ex-BN 6364 and 8011 await their call for the North Local. 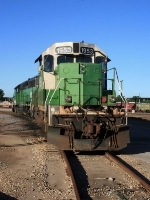 Description: BNSF La Crosse Yard. Description: The Grand Rapids Turn has some unusual power this time, normally a trio of Geeps pull it, but this day, a Dash 9 leads a SD40 - 2, a GP38 - 2 (GP40 rebuild), and a GP39M on the Lake Sub, a BNSF train with a SD70MAC and a NS SD70M is about to arrive on the Hinckley Sub.